With nearly 100 exhibitions and featuring more than 250 artists, the eighth Glasgow International festival, which continues until 7 May, is a bustlingly busy affair taking place in venues across Scotland's largest city. To help you navigate it, seven writers on the a-n Writer Development Programme 2017-18 offer their recommendations following an intense and varied opening weekend. From the quietness of two motorised snails moving slowly across a white cube space (Urs Fischer, The Modern Institute, Aird’s Lane, until 26 May) to the intense noise of one-second blasts of a Nirvana concert (Raydale Dower, CCA, 19-22 April), the opening weekend of the eighth Glasgow International provided a typically diverse collection of activity. 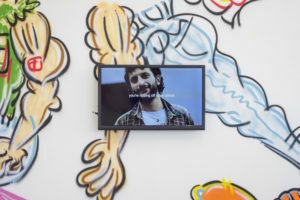 While much of the focus was initially around the Director’s Programme featuring artists such as Mark Leckey, Lubaina Himid and Cécile B.Evans, as ever it’s by seeking out the works in the many smaller-scale, often artist-run shows that the enjoyably sprawling GI experience really unfolds. Off the beaten track is invariably a good place to look and Glasgow’s post-industrial landscape is a generous provider of spaces for artists to present work in. At the Pearce Institute in Govan, for instance, Chapter 13’s ‘The Landis Museum’ packs work by seven artists into a tiny room to create a smart show brimming with ideas and encounters. One of my own favourite, unexpected encounters over GI’s first few days was viewing Erica Eyres’ very funny, on the button video in the ‘Girlz Club’ exhibition at Glasgow Project Room, in which through a mock TV interview I was introduced to Anne 2.0, an AI artist who performs on demand and even “folds down for easy storage”. Everyone, of course, will have their own GI recommendations. The ones that follow have been picked by participants in the current a-n Writer Development Programme, who were tasked with seeing as much as they could of the festival during their visit before selecting three notable shows or works. 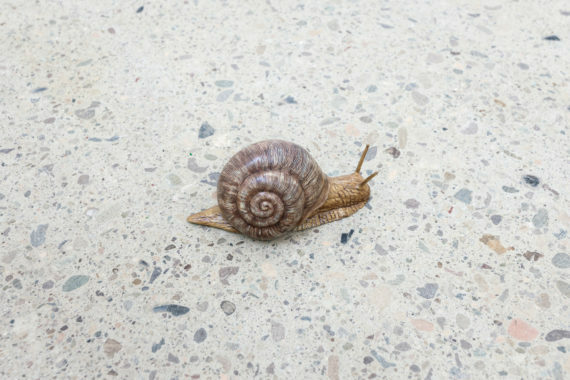 With their choices to hand – perhaps printed out, folded and easily stored – maybe, like Fischer’s snails, you can enjoy GI at a slightly more leisurely pace. From the perspective of Algonquin First Nation people, Montreal-based artist Nadia Myre allows the audience to consider what has led to this moment in history by presenting work that explores early colonialism and capitalism. Curated by Mother Tongue, ceramic works are inspired by excavated fragments of pre-packed tobacco pipes, one of the first disposable products. A pair of photographs depicting a pipe and a collection of clay pipe shards take on an ethnographic hue. Myres challenges this static and western way of presenting knowledge through sound pieces, performance and by weaving imitation pipe shards into skeletal nets, baskets and ropes. The history of tobacco is entwined with Glasgow; GoMA is the former residence of ruthless tobacco trader William Cunninghame. Addressing Cunninghame and his ilk, The Beaver’s Tobacco is a collaboration with artist Rudi Aker – a cautionary and urgent tale about those who take from the earth and give nothing in return. Until 7 May, The Briggait, 141 Bridgegate, Glasgow G1 5HZ. In 1922 Sophie Taeuber-Arp published ‘Remarks on Instruction in Ornamental Design’, detailing eight instructions for making art. Susanne Nørregård Nielsen has used this archival text to create eight new abstract drawings (below) to bring Taeuber-Arp’s intriguing philosophies to a new audience. Nielsen’s practice is centered on uncovering (and appropriating) what is left out of histories of 20th century modernism. 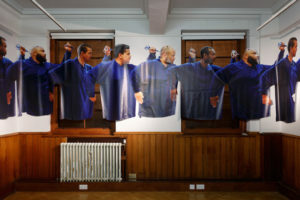 The painting lecturer at Glasgow School of Art has found these oversights often encompass work by female artists and practices such as embroidery or weaving. 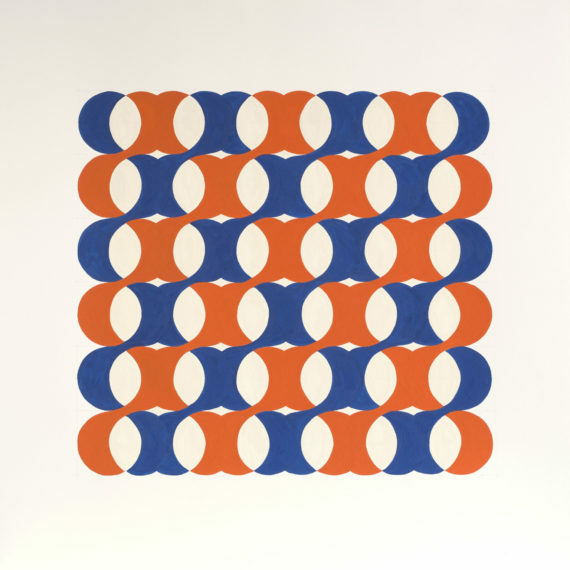 Previously this has led Neilsen to recreate Suprematist dresses designed by Kazimir Malevich and to take up weaving to understand the processes of Anni Albers. Weaving is evident in the drawings on display, where a careful selection of colours create an exquisite weft and warp effect. Nielsen’s drawings provide encouragement for those seeking to generate new work through artist archives and showcases how artists can retell art history through their own practices. Until 7 May, Reid Gallery, Glasgow School of Art, 167 Renfrew Street Glasgow G3 6RQ. London-based artist Nnena Kalu has been in residence at Project Ability Gallery for the first four days of Glasgow International, creating an exhibition of exuberant sculptures that explode with colour and texture and seem to celebrate the sheer delight of making. Responsive to her materials and the creative process, the enticing shapes of Kalu’s sculptures at Project Ability have evolved from apparently endless layers of sumptuous coloured tape and crisp plastic wrap, precariously balanced on wooden supports. Kalu undoubtedly has an essence of Phyllida Barlow about her but Kalu’s ingenuity makes Barlow look demure and restrained in comparison – her colour pallette is riotous and the taped shapes crackle with surprising, boundless energy. Unsurprisingly, this is not Kalu’s only exhibition this month. She will also be showing in ‘Spring Syllabus’, curated by Lisa Slominski of Slominski Projects, at J Hammond Projects in London from Thursday 26 April. Until 26 May, Project Ability Gallery, 1st Floor, Trongate 103, Glasgow G1 5HD. The shopkeeper at Garnethill Stores watches on as I chuckle and photograph my way around the shop, seeking out interventions and installed artworks among the standard corner-shop fare. In the shop window I noticed a comically ugly rubber facemask but it sat amongst such weird and wonderful products that I only half-expected it to be part of the exhibition. ‘Good £uck’ sees five artists placing their work in the shopfronts and shelving displays of five independently-owned stores across the city. A quick browse through social media reveals how dear these shops are to their local communities but it’s a stretch to imagine any tourist dollars making it this far, and that alone provides justification for the project. Before I left Garnethill Stores I made a point of buying some snacks to get me through the remainder of the day’s GI marathon. I’d have chased it with a Diet Coke from the fridge were it not for the gauntleted, yellow hand that grasped onto it like grim death. On the oldest street in Glasgow, in the back room of a former British Linen Bank building that has long outlived its intended purpose, a rough-hewn white curtain ripples in the breeze. Featured in the group show ‘Against Time’, this is Sarah Forrest’s film Again, it objects, which continues in the same way for another six minutes. In the centre of the screen a text piece places existential uncertainty into the heart of a domestic setting. The narrative – which unfolds in the second person one word at a time – describes the appearance of a black circle in your living room, into which one of your Nike trainers disappears, followed by a table lamp. You, the film says, simply stand there, looking at your sock. The entire story plays out in time with the opening bars of AC/DC’s Back in Black, at a volume high enough to shake you off your viewer’s high-horse, reinforcing both the theme of the void and the ambiguity of existence. Marco Giordano, I’m Nobody! Who are you? A car is heard moving through the streets of central Glasgow long before it is seen. Italian-born Marco Giordano has installed speakers on its roof and is driving around the city performing I’m Nobody! Who are you? for the duration of the festival. The piece comprises a printed handout as well as the audio performance and reflects the recent general societal trend in sharing what once would have been unquestionably private information. The non-narrative form of the text loses nothing in being partially heard, but if you do happen to catch it as you wander the streets of Glasgow this coming fortnight, I recommend you stop and listen to this part-manifesto, part-poetic contemplation on privacy, publicity, and revelation. Until 7 May, various locations across the city throughout the festival. 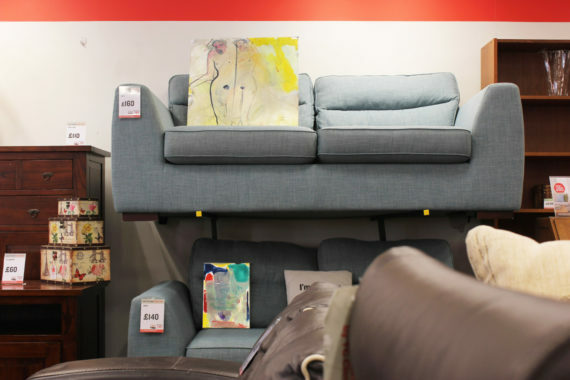 Within a typical working charity shop, Simon Buckley and Othmar Farré have curated an installation of paintings by 17 artists which becomes a fun game of spotting un-priced ‘fine art’ amongst the shop’s good-value headboards and bargain-bucket prints. This critique of worth and hierarchy between consumer products and different markets alters the everyday shopping experience, encouraging you to view the goods, their purposes and ‘venue’ in new critical light – a painting of a frightened-looking raccoon for instance is pitted against a modest brand-new divan. The considered placement of the paintings, changing daily, creates ‘conversations’ between them, as if they are nattering over a coffee table like old friends. The staff in the shop were busy helping customers find house decor while GI punters hunted weird and haunting paintings such as Olga Cerkasova’s yellow-eyed woman, models (untitled), 2012, and the striking grisaille imagery of Michael Fullerton, who also has a solo show at Queen’s Park Railway Club. Until 7 May, British Heart Foundation, 22 Stockwell Street, Glasgow G1 4RT. On entering the opulent interior of The Savings Bank, a sublime atmosphere of past, present and future time is beautifully and tragically fabricated. This detailed audio-visual installation, with a daily cabaret-style diva performance, is an evocative stage-set scenario, drawing on a multitude of references: Derek Jarman, Enochian language of angels, cosmic pessimism and queer theory. A sense of mystic reverie and lamenting an end-of-world apocalypse is created that is theatrically convincing, using a sleek array of seductive materials. This darkened space mourns the planet we forgot amidst our digital and consumer infatuations, while Calvin Klein advertisement models shimmer to remind us of unreachable perfection, and our navel-gazing. The bank’s Victorian grandeur symbolises both prudent saving and lavish excess, and the speculative purgatory feels like walking through Blade Runner 2049, where the virtual and ‘real’ converge and all we really can do is have a drink, laced with meteorite rocks. Until 7 May, The Savings Bank, 67 Bridge Street, Glasgow, G5 9JB. At first glimpse this is an unassuming exhibition, featuring striped wall-based fabrics nurturing rocks and two large curtains curving through the gallery. But experienced alongside the accompanying audio this installation collapses geological deep time and human temporalities with physical and perceived space, to weave an account in three acts. Set in locations such as a ship’s quarterdeck, the story proposes that continental Africa is eventually going to slip over the European landmass, inverting sedimentary laws. The allusions to sailors’ voyages, cake baking and fossils ‘orphaned’ in museums from their kin conjures links between stratigraphy and cake layering to create a fascinating commentary on migrating matter, people and objects. The collision and shifting of tectonic plates and people is also explicitly told through a myth about a Gibraltar cave that channeled directly to North Africa. Kiwanga highlights how continents move geo-physically but also politically, becoming welcoming or self-isolating, friend or foe. Until 17 June, Tramway, 25 Albert Drive Glasgow G41 2PE. 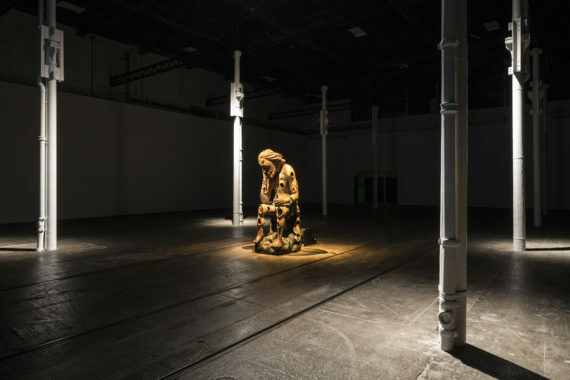 Tramway’s cavernous gallery is occupied by a single illuminated figure seated at its centre. A scaled-up statue of the biblical character Job, the figure is large in size but abject in nature, its flesh pitted with gaping wounds. Inside this pitiful body is a 21st century sound system dispensing bodily rumblings, gurgles, wheezes, mechanical rattles, electronic beeps and deep resonant drones, as well as occasionally humorous, often poignant philosophical musings delivered in a despondent northern accent. Opposite, a CGI projection depicts the figure amid changing scenes of interiors, vegetation and a pseudo-anatomical exploration. Sound and visuals build to a quasi-religious climax, only to quickly fall back to the beginning of the hopeless soliloquy. The combination of humour, pathos and technology creates a unique reminder that in our glossy, high-tech world, the one thing we can’t get rid of is the messiness of being human. Until 1 July, Tramway, 25 Albert Drive, Glasgow, G41 2PE. ‘Cellular World’ features work by nine artists relating to themes of identity, science fiction and life in the Internet age. Sam Keogh’s Kapton Cadaverine seems playful but risky. With a web-like coating of plastic and silicone covering his installation, Keogh explores a familiar trope of a lost astronaut waking from his cryonic sarcophagus and struggling to piece together his identity. Cécile B. Evans’ double-sided installation Something tactical is coming highlights the complex relationship between digital and physical reality with a network of small screens and exposed circuit boards, a miniature scale-model office and physical manifestation of a little “oily milky fog”. Lynn Hershman Leeson’s 1994 film, Seduction of a Cyborg, creates a thought-provoking yet familiar scenario highlighting questions about the pros and cons of physical enhancement and technology addiction. This complex exhibition explores many relevant 21st century issues and benefits from a second viewing away from festival crowds. Until 7 October 2018, Gallery of Modern Art, Royal Exchange Square, Glasgow, G1 3AH. This group exhibition of nine artists is curated by curatorial group Home-Platform and artist-led gallery Gossamer Fog. A semi-industrial loft space has been transformed into a fascinatingly uncomfortable environment, prickling and pulsating with electronic sound from screens and speakers. Pools of unnatural pink, green and yellow light illuminate tangles of cables and tubes; straps and scaffolds support unfamiliar organic structures and canisters of unidentified liquids glow alongside luminous neon-coloured Perspex. Amorphous shapes, plastic-like gels and slimy deposits seem to indicate collapsed, degraded or developing organisms; rubbery tentacles grip a wall, medical drip bags and wires add to an overall impression of improvised life-support systems connected by overwhelmed and ageing technology. As with all the best sci-fi, the work in this show begins with a firm research base founded in the reality of contemporary science, reflecting the gradual merging of man-made and natural through bio-medical science, bio-technologies, and perhaps, bio-accident. Until 7 May 2018, 71 Houldsworth Street, Glasgow, G3 8ED. In her first show in Scotland since 2014, Glasgow-based artist Corin Sworn presents a new installation stemming from her interest in societal structures. A video shows two dancers performing in the space the viewer is stood in, creating an uncomfortable and quietly troubling experience. The dancers perform with arbitrary rules enforced upon them, and the accompanying score uses the same language of control: sampled police sirens, alarms. 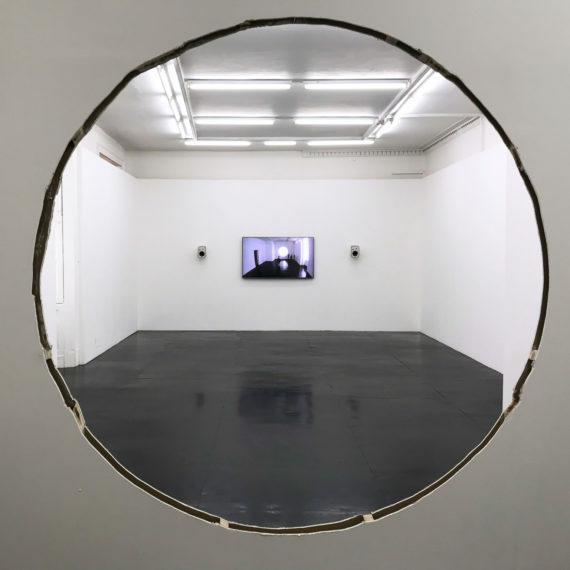 The gallery has been sealed off with a stud wall, then crudely cut open with a bandsaw or similar tool to create a vertical cut-out stripe and a giant circle. At its most basic level this act forces a similar interaction with the space as the dancers are enacting. In the rear of the space whitewashed calendars, sketchbooks and hospital-santizer dispensers are smaller exercises in control that feel part of something much bigger, with Sworn’s clarity of approach highlighting the darkest elements of their systemic possibilities. Until 2 June, Koppe Astner, Suite 1—2, 6 Dixon Street, Glasgow, G1 4AX. 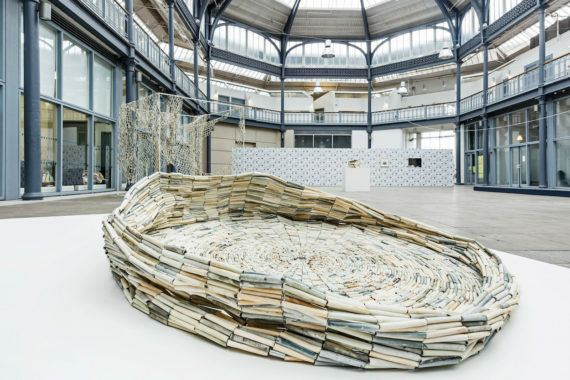 Richard Wentworth and writer Victoria Miguel have combed words, phrases and sentences from their respective practices to create A Roomful of Lovers (Glasgow) (2018), using a mutual passion for language for an installation dedicated to Michael Samuels and Christian Kay, professors at the University of Glasgow and editors of The Historical Thesaurus of the Oxford English Dictionary. The large former warehouse is laced with 600 metres of galvanised steel chains on which manuscripts of collated words on A4 translucent paper are attached, as if the industrial chains were no more than a paperclip. Text has been edited from glossaries and personal dictionaries to form a bespoke thesaurus, earnestly given to its readers. There are different levels of complicit and explicit editing in play here, and the feasibility of reading texts, the spotlit areas of focus, and the way the metal chains create a kind of soft choreography all reinforce the impact of this heartfelt focus on language. Until 7 May, SWG3, 100 Eastvale Place Glasgow G3 8QG. Curator Richie Moment is tired of what he feels are glaringly obvious and boring site-specific shows. Taking a more socially-oriented approach, ‘CHUMMING’ (Scottish vernacular for accompanying a friend, and fishing with bait) is a well-rounded exhibition over four floors. Jack Burton’s corrugated card framed Yfed Gormod Gorfod Gadael (2018) is robust: a sunset skyline photograph with diaristic spray-painted statements and iconography. Jessy Jetpacks LADiator (2018) is a humorous projection with self-fulfilling stories about ripping a dog’s heart apart and other anecdotes. On the same floor, Moment, as curator and therefore the likely author of a statement contesting site-specific shows responding to windows, has indeed responded to the windows, blacking them out and carving throwaway motifs to let the light shine through multiple coloured gels: taxi signs, faces, symbols. The piece, in a nod to his own contradiction, is titled You see right through me (2018). A definite must see, the works in ‘CHUMMING’ approach the notion of site-specificity with humour, dialogue and joy. Until 7 May, The Pipe Factory, 42 Bain Street, Glasgow G40 2LA. South African collective iQhiya present ‘Plenary’, a site-specific installation at Transmission. The artist-run gallery is an apt location for this response to the historical and contemporary erasure of women and gender queer people of colour in Scottish cultural programming. On the opening night of their show, the collective of black women artists held an invite-only dinner for women and non-binary people of colour working in the arts. The table where they shared food, drink and conversation remains situated in the centre of the gallery, replete with remnants of the meal. A blue wall bears chalk drawings, quotes, photographs, statements, and a reading list, and fragments of text conversations are displayed in the windows. A moving short film by a member of the collective who recently passed away plays on a loop in the basement. With the artists now gone and the ‘performance’ over, ‘Plenary’ still stands as a potent testament to thought processes, community and decolonial discourse. A recording made during the opening night dinner forms a backdrop to the space, generating a convivial atmosphere, a further trace of this meeting of minds, and simultaneously evoking a sense of absence. Until 7 May, Transmission Gallery, 28 King Street, Glasgow G1 5QP. 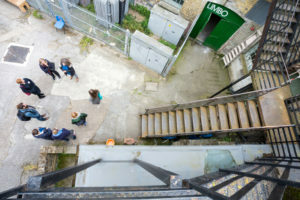 The process of creating ‘Personal Structures’ has seen multidisciplinary artist Jessica Ramm – a participant in the a-n Writer Development Programme – engaging with the architecture and social context of Platform with a many-faceted approach to both space and community. Ramm has worked with local people to produce her exhibition which features prints, video and sculpture, foregrounding process and collaboration. The simplification of manufacturing processes and use of materials to hand has resulted in temporary floor-to-ceiling structures that speak of resourcefulness, experimentation and play. Held together with innovative knots, hinges and lashings of twine, this textural environment is a statement against austerity and for the personal agency enabled by freedom of imagination and a DIY ethos. The work is aesthetically compelling in its own right, while also offering itself, akin to iQhiya’s ‘Plenary’, as both the residue of a working method involving people now absent, and as a site of ongoing encounters and dialogues. Worth the journey (off the beaten path) to Easterhouse. Until 27 May, Platform, The Bridge, 1000 Westerhouse Road, Glasgow G34 9JW. 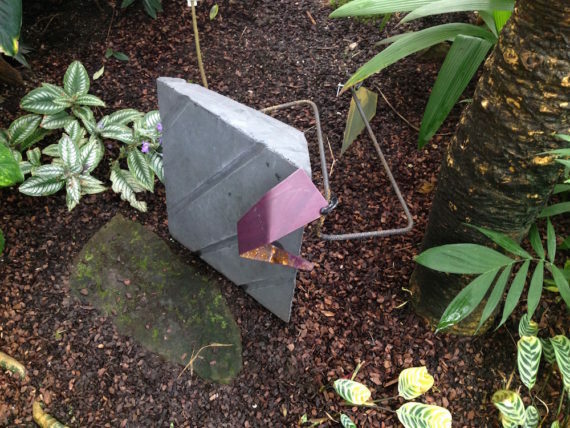 This site-specific group exhibition features the work of eight artists and comprises subtle interventions and installations within the Botanic Gardens’ glasshouses. Sculptures created from materials such as plastic, ceramic and metal are sensitively situated within the living collections. The art does not compete with or distract from the abundance of flora, and this is its strength – manmade and natural forms exist in harmony in this indoor sculpture garden. While the glasshouse can be understood as a historically and socially resonant site, the show seems to steer clear of the political and is refreshing for its concern with materiality and form. Highlights include concrete and metal sculptures by Carla Scott Fullerton, and a series of installed drawings by Kari Stewart. Encountering artworks in this setting is a multisensory experience – the humidity and fragrance of the glasshouses create a dynamic atmosphere that befits the work. Until 7 May, Glasgow Botanic Gardens, 730 Great Western Road, Glasgow G12 OUE. 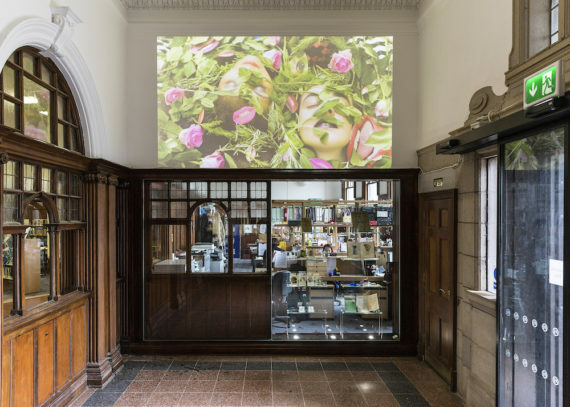 ‘Linder’s Flag and Film’ is the first of a sequence of commissions for the entrance and façade of the Glasgow Women’s Library building, which relocated to its current home in 2014 having grown from a small grassroots project into a hub for information by, for and about women. The artist’s wide-ranging source material includes feminist and lesbian texts and historical sources associated with the persecution of women as witches. Both flag and film juxtapose colourful foliage with sensuous mouths, a reminder that women’s traditional knowledge of herbal lore has often been held in suspicion. The works displayed are a luscious celebration of the achievements and freedom women have already won as well as an invitation to step back and forwards into various lineages, and to reflect on the possibilities of women’s lives. Until 7 May, Glasgow Women’s Library, 23 Landressy Street, Glasgow, G40 1BP. Winnie Herbstein’s video installation includes interviews in which women working in trades describe the challenges they face and satisfaction they derive from earning a living in male-dominated construction industries. Their stories are of trial and acceptance, physical exertion and camaraderie. Herbstein is a member of a women’s welding collective called Slaghammers that meets at Glasgow Autonomous Space, and parts of the video document women learning and teaching each other to weld. According to Herbstein: “We set up the group because we were fed up of feeling that we couldn’t quite access these masculine spaces, even though we have skills or ability…” Shots taken inside a partially constructed house provide a moment to reflect upon assumptions about how the workforce that builds the home is gendered, as is the care and maintenance work that proceeds within it once it’s built. Until 7 May, House for an Art Lover, Bellahouston Park, 10 Dumbreck Road, Glasgow G41 5BW. Until 7 May, Market Gallery, 334 Duke Street, Glasgow G31 1QZ.